The restaurant established on an early whaling station site in 2002 and is built from gathered collectables and demolition materials from all over New Zealand. The owner Fleur Sullivan has made her reputation in Central Otago where she established Olivers restaurant and has received numerous awards for her restaurants and in recognition for her contribution to tourism. Come and stay - Enjoy the tranquillity. The restaurant, run by the inimitable Fleur Sullivan, was 'Just one of those places that keeps cropping up in conversations' whenever there was a gathering of 'foodies', he said. Set in the sleepy little fishing village of Moeraki on the Otago coast, Fleurs Place has an unbeatable setting. There's water on three sides, fishing boats bobbing in the harbour, the famous Moeraki boulders across the bay and, to the north, the open sea. Fleur uses only the freshest of local ingredients - indeed, fishing boats land their catches right into her restaurant. This book combines recipes supplied by Fleur herself with photographs of the spectacular scenery of coastal Otago and the Moeraki area. 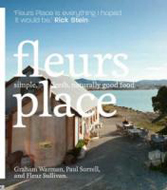 Side-bar text includes information on Fleur, the restaurant, local suppliers and the Moeraki area.